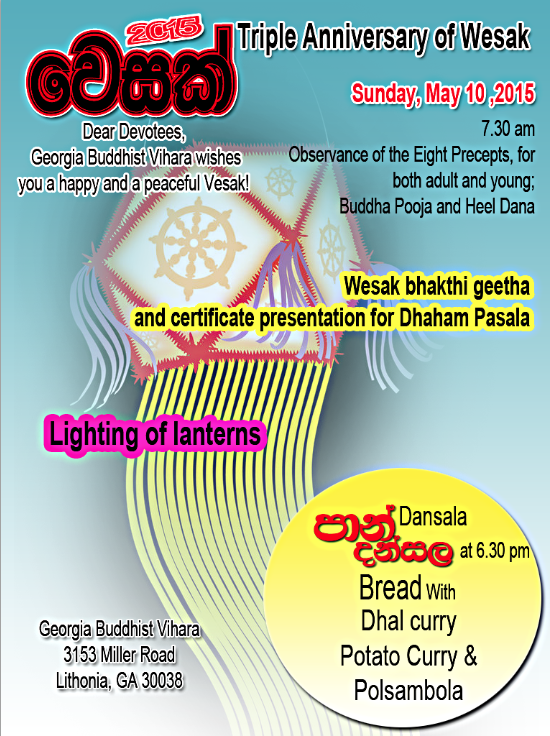 Georgia Buddhist Vihara wishes you a happy and a peaceful Vesak! Our annual Wesak program celebrates three events of the utmost significance in the life of prince Siddhartha who became a Buddha – His Birth, his attainment of Enlightenment, and his passing away. Georgia Buddhist Vihara warmly invites you to be a part of the triple commemoration. Wesak full moon day has been for centuries regarded as the Buddha Day. For it was on a Wesak full moon day, that the Sakyan prince Siddhartha Gautama was born, in Lumbini Park, on the frontier of Nepal, attained Enlightenment, under the Bodhi tree in Gaya, and passed away in Kusinara. The Buddhists all over the world celebrate with devotion the Triple Anniversary of Wesak. To a true follower of the Buddha, there is no greater day than Wesak Poya which also symbolizes peace, love, compassion and piety. Dana offering to the monks and those who observe eight precepts.